Exactly what the name implies, Big Creek in the Smokies is larger than some rivers in the area. Add in a 70° day after a couple snow events and Big Creek will really roar. When Big Creek roars, that brings out the kayakers, so there was even more of a show than just the scenery. Big Creek Trail is an old logging road that follows the creek westward beneath the Cammerer and Mount Sterling Ridges. There are two featured waterfalls along the way: Midnight Hole and Mouse Creek. Beautiful spring-like weather and scenery, rapid whitewater and kayakers all made for a delightful trek on Wednesday, March 4, 2015. I hiked Big Creek Trail to Mouse Creek Falls between 10:30AM and 12:45PM. My plan was to simply enjoy the day and the experience while hiking from Big Creek Campground to the waterfalls and back. Hike Configuration: Up and back. Blaze: None needed. Hike Rating: Easy. Very gradual uphill grade. Trail Condition: Excellent. Old logging road with minimal rocks. Starting Point: Trailhead at the end of Big Creek Road. Trail Traffic: I encountered one other hiker and lots of kayakers. How to Get There: From I-40, take the Waterville Road Exit (Tennessee #451). Turn left after crossing the Pigeon River into North Carolina and proceed 2.3 miles to an intersection with Mt. Sterling Road. Continue straight, the ranger station is on the right. Pass the ranger station another 0.4 mile to the parking area at the end of Big Creek Rd. The trailhead is on the right. When you exit I-40 at Waterville, the first exit in TN west of the state line with NC, you are diving into the Pigeon River Gorge. The Pigeon River flows roughly parallel to I-40 for many miles in western NC. It is impounded by Walters Dam creating the long, narrow Waterville Lake. It enters Tennessee just after the village of Waterville, and continues with I-40 in the same valley northwestward through Hartford to Newport, TN. The Pigeon River dam was completed in 1930. This concrete dam is 180 ft. high by 800 ft. long. The brick power plant located in Waterville is actually 6.2 miles from the dam at the confluence of Big Creek and the river. A tunnel 6.2 miles long stretches from the dam to the power plant. Periodically, there is a water release from the dam, creating some pretty gnarly recreational whitewater that brings the rafters and kayakers from all over. Scheduled releases from the dam are historically from Memorial to Labor Day on Tuesday, Wednesday, Thursday, & Saturday, from noon – 6:00 pm, but they also have unscheduled releases off season. Not far past the power plant Waterville Road crosses Mt. Sterling Road and enters the Big Creek area of the Smokies national park. The ranger station is about a quarter mile in on the right, and the campground is another 0.4 mile farther where Big Creek Rd. ends. The trailhead for Big Creek is on the right just before the parking cul de sac at the end of the road. Big Creek is one of the lowest areas in the national park at just over 1,700 feet. Combine that with the relatively easy nature of the Big Creek Trail and you have a great hike for beginners and families. In the warmer months when the campground is open it can be quite crowded simply because of the popularity. However, if you venture here off season you might just find that you have Big Creek all to yourself. 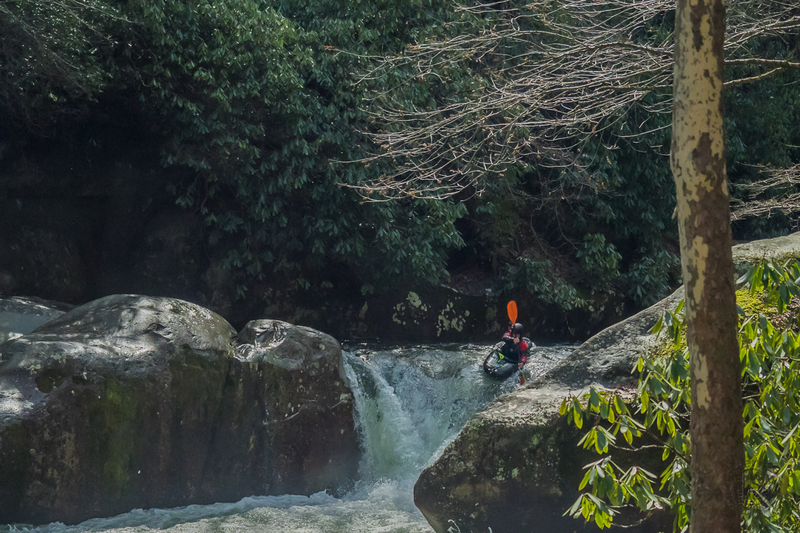 With recent heavy snow in the Smokies and a day that actually reached above 70° for the first time in the season, Big Creek was really rippin’ and roarin’ from snow melt. I could tell before I even saw it just from the sound. I was also there about six weeks earlier and it wasn’t nearly as loud. As beautiful as the weather was, I was one of only three cars in the parking area. That surprised me, but by the time I finished it would change. When you start the Big Creek Trail you head uphill for the first half mile, and the trail leaves Big Creek far below. You might think, wait, why is the trail going away from the creek? Don’t worry, once they rejoin, they stay mated for the duration. The trail itself is an old logging road and therefore nice and wide, and smooth, with a very gradual incline. The climbing isn’t tiring at all. Back in the 1930s the Civilian Conservation Corps converted the old logging road into the hiking path we still enjoy to this day. Once back alongside Big Creek, the truly picturesque nature of this hike begins. There are a number of splits in the path of the creek as it flows on either side of small islands. Perhaps sometime in warmer months when the water isn’t flowing as heavy it might be interesting to wade the creek and setup for pictures on one of those islands. At the 1.4 mile mark you reach Midnight Hole, a small in stature, but mean in intensity waterfall. Only about 6-8 feet high, because it is surrounded by large boulders it really packs a punch as the water rushes between the narrow opening. There is a large pool at the basin of Midnight Hole that is quite popular in summer as a swimming hole, perhaps even late at night. Thus, Midnight Hole. I stopped there for a sandwich and some photos, looked back up at the trail, and saw a couple guys walking by carrying their kayaks over their shoulders. Gee, I thought, I wonder if I wait here 10 minutes if I might be able to get some pictures of them going over the waterfall? My patience was rewarded. That was fun… really my first chance at action photography out in the wild. Once the kayakers continued on downstream, I packed up and resumed the hike. Another quarter mile later you will pass Bettis Branch coming down from the left (east) into Big Creek. Then, a quarter mile past that, at mile-point two up the trail, you reach the confluence of Mouse Creek with Big Creek. Mouse Creek is a lot bigger than Bettis Branch, especially on this day. The water was just pouring over 45 foot Mouse Creek Falls from the Mount Sterling Ridge high above. The view point for Mouse Creek Falls is about 40 feet off the main trail to the left. There’s a bench there so you can take a load off. The combination of two torrential creeks joining here made for quite the sight and sound show. It was really loud, and whitewater was splashing everywhere. During previous visits I have climbed down the 20 foot bank to be creek side, but not this day. No how. No way. I just setup my tripod next to the bench and took pictures from the top. Photos were pretty tough. The sun was really, really bright on this glorious day. Even with multiple filters the whitewater was pretty washed out. But I didn’t care. It was truly a treat just to be there. It was the first time in months I had been outside with just a t-shirt. Particularly with the late February brutal cold, I was thoroughly enjoying every moment of this memorable experience. While I was there, another pair of kayakers went sauntering by. These guys were even braver than the first, starting higher up the watershed. After 20-30 minutes I’d had enough and decided to head back. Big Creek Trail continues upstream for several more miles eventually reaching Walnut Bottom and a backcountry shelter. There it becomes the Swallow Fork Trail and climbs steeply up Mount Sterling Ridge. If you want to do a major 18-mile loop, you can continue along the ridge to Mount Sterling, then come back down on Baxter Creek Trail. I’m told that large loop is one of the most difficult hikes in the park. As I ambled my way back down the trail it was well above 70° now and I was in Smoky Mountains heaven. My senses were filled. The sky was a dazzling cerulean blue. The rush of the creek filled my ears and the fresh smell of the clear water teased my nostrils. There were already spores popping out from the moss that covered the long down logs on each side of the trail. It won’t be long until wildflowers. As I continued back downhill for the next half hour I passed more kayakers with their 8-foot long hats. When I returned to the parking area it was a madhouse. Nearly every one of the two dozen parking spaces were filled, and there were kayaks laying all about. There had to have been at least another 20 guys getting ready to take their plastic crafts up Big Creek. I packed up my gear and skedaddled quickly before I got blocked in. In summary, Big Creek is a very easy, very scenic hike along a major water artery that defines what the Smokies are all about. Water, water everywhere. Big Creek Trail is easily doable in all four seasons and is family friendly. You are likely to run into big crowds during wildflower season, and in the hot summer when folks are looking for refreshment from a cool Smoky Mountain stream. If you arrive early in the morning you can beat most of the crowd, and still have time to check out some of the other trails that start and end at Big Creek. Update Sunday, January 21, 2018: Following three weeks of bitter cold at the new year, the air warmed nicely the third weekend of the month. Seemed like a trip to Big Creek was in order. There were still hints of snow and ice around, including on the rocks in Big Creek, and icicles pouring down alongside the trail. This was my first chance to look at Midnight Hole and Mouse Creek Falls in winter, so that was a nice seasonal change. The government was closed on this weekend, but a couple dozen other hikers and I enjoyed our outing despite the turmoil in Washington. Update March 29, 2019: I haven’t posted any of the spring ephemeral wildflowers that grow along Big Creek Trail. So, consider that taken care of.